We’re about to spring into summer folks.. soon soon soon! With all of these new Bernat Pop colors, it’s so easy to create eye catching fabulicious fun! I mean, it’s hard to resist! I know I couldn’t, and that is why, with great pleasure, I bring you, this new FREE Northern Lights Handbag pattern! When I saw someone post that they found these new, fun cakes at their local Walmart, I was so excited about finally having the opportunity to play with a new yarn. The Caron & Sweet Rolls cakes have been all the rage; unfortunately, the closest major craft store is an hour from me, so I’m stuck with my Wally world and a little local yarn shop that sells mainly specialty yarns. I just haven’t been able to justify buying online and paying shipping cost, so my adventures with these cakes would have to wait until I had a need to travel to those parts. You can imagine my excitement when I heard the news that Walmart would be carrying these Pops! I waited and waited and a couple of weeks after learning about the Bernat Pops, the lady in the craft department was wheeling them out. I was the 1st one there to grab my small stock to try out. Bernat Pops is soft, comfortable to work with, the colors are fun & I must say, very convenient, which brings me to my next mission… buying a yarn winder so I can turn all of my skeins into cakes! The beach bag is actually the 2nd bag I made. I had not even come up with a name for these handbags until I had my finished beach bag sitting in front of me with all of the lovely colors.. The name was fitting to me & I’m very happy with how they all turned out. 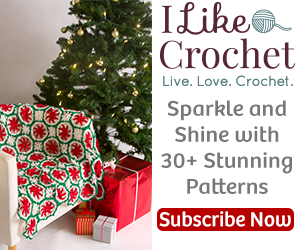 One exciting thing about this pattern is you can get very creative, design your own size with the layout I’ve given you in this pattern. Drop or up ther hook size, and honestly, use any yarn you like! You don’t have to use the Pop to make your project POP! you will still have a fetching bag with your favorite multi-colored yarn. The video tutorial offers a couple of different options for creatives in the flap and the icord handle / straps, so make sure you check that out as well. Just a quick note…YarnWars has been having some technical difficulties, the website is being worked on. You may have no troubles at all getting to the page, however, if you do experience any difficulties retrieving the pattern page, you have a couple of other options, you can pick up the downloadable/printable pdf in the Files tab of the YarnWars Facebook group or you can work along with the video on my Youtube channel. Either way, you will be able to obtain access to the pattern. I really hope you all enjoy this, I always love the opportunity to create and share with you all! I can hardly wait to try your bag patterns. I got an email saying my Stanwood Yarn Winder is on its way. I’m so excited. We must be peas in a pod!